I was so adamant about writing this couple’s story that in spite of my poor vision; I took my son’s truck and headed over there. You should have seen the look of horror on my husband’s face when I told him what I did. That’s nothing compared to the looks from other drivers. I was excited to meet George and Ruthie Dugan, and likewise, about this interview. Not because there was anything particular about their story that I was aware of in advance (or because I got to drive myself there), but because I have discovered these marriages that have lasted over half a century are completely amazing, and each one is a beautiful, yet, unique story. As of December of 2018, they have been married for 50 years. Ruthie is 69 years old, while George is a young 71, soon to be 72 in June. They’ve been blessed with two children and several grandchildren, two of which are twin boys. “They’re all good kids,” George said of his grandchildren. “Yeah, it was the last nine months of my tour, too,” George stated recalling those many years ago in the service. “When I got out of the Army, I did a lot of small home repairs and yard maintenance until I finally retired. “What kind of work did you do in the service?” I asked of George. I thought that interesting. I know several male nurses who first started out as a medic in the armed services. It’s rare that the people don’t stay in the medical field when their tour of duty ends. “I don’t know. Just dumb, I guess,” he said thoughtfully. Ruthie picked up from there and elaborated. “We both just knew that we would eventually get married. Our families put the wedding together in six weeks so; it was really fast once we got engaged. George shook his head no. “I think I’ll keep her another 50 years,” he answered. Spoken like a good husband. Thank you both for allowing me to come into your home and write about you. It was a pleasure, indeed. 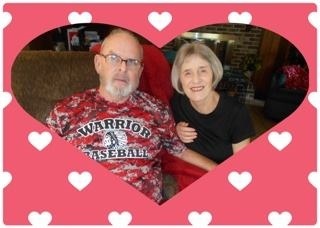 Happy Valentine’s Day George and Ruthie. I know you’re looking forward to many more of them.